In Ireland water is abundant. The problem is however, that it doesn’t fall in predictable uniform amounts. Regularly watering the turf ourselves should alleviate the problem, but it isn’t that simple. Due to the nature of both soil and water, water does not uniformly wet the soil. Water penetrates the soil unevenly, runs off or lies on the surface due to the soil being water repellent. It behaves in an erratic manner causing defects in the grass growth resulting in poor grass coverage. (See fingered flow diagram below). In order to get the best from turf playing surfaces we need to offer nature a little help by using the range of Aquatrols water management products: These products have differing specifications and varying degrees of sophistication, but all work to make Water Wetter! This encourages the water to work its way to where it is needed – into the root zone of the grass. (See matrix flow diagram below). Revolution is a patented technology that extends turf’s natural antioxidant activity and significantly increases stress tolerance by balancing air-to-water ratios in the soil. Ensures consistent moisture and air levels throughout the rootzone. Reduces surface wetness, which results in firmer playing surfaces and increased turf quality. This unique chemistry has been tested and proven by leading turf and soil scientists world-wide. More info in our Revolution PDF. Dispatch is a patented technology that maximises irrigation efficiency and distribution uniformity while providing 30-50% water savings. 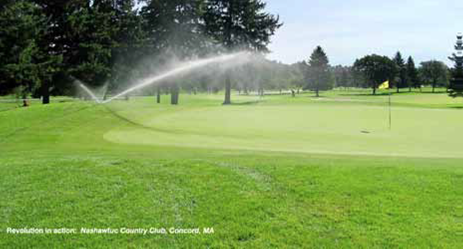 Dispatch has shown to reduce surface runoff significantly, allowing more irrigation and rainfall to enter into the soil, helping to recharge moisture levels to provide quality turf. Dispatch helps to get soil targeted products where they are directed. Formulated for injection through the irrigation system or it can be sprayed onto turf. Primer Select provides matrix flow of water in the rootzone. It encourages uniform downward and lateral flow of water. Particularly useful for holding moisture in young greens and areas such as tees where irrigation may be poor. Aqueduct, is a unique surfactant which takes care of problem areas quickly and affordably. It works as a curative, particularly for hot dry spots. Aqueduct is a great recovery product that won’t burn your turf! Rate: 20 L/ha. 1 L bottle for use with Dilute-N-Shoot hose end applicator. 1L & 10L pack. Pellet form of wetting agent designed for use with hose end applicators. Fifty 90 is a long term wetter with 3 months longevity. Safe on all highly maintained turf. Available in liquid and granular formulations.